With all of the online buzz currently surrounding Krizz Kaliko, another familiar face dropped in to salute the emcee on Twitter. 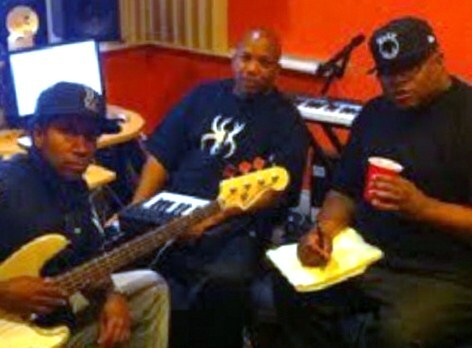 Taken from the studio, this photo of E-40 and his crew was shared over Twitter recently. Sporting a Krizz Kaliko t-shirt, one of the crew members showed his support for Strange Music’s genius. Fans may recall that E-40 and Krizz Kaliko have collaborated numerous times before, including on Kaliko’s Genius album. More recently, Krizz Kaliko replied to a fan over Twitter and confirmed that the two were working on new music. With Krizz Kaliko’s Kickin’ And Screamin’ now scheduled for May 15, perhaps listeners will get another taste of what the Bay Area Ambassador and Krizz Kaliko have to offer. Have you heard Krizz Kaliko’s past collaborations with E-40? Do you think E-40 and Krizz Kaliko will collaborate on Kickin’ And Screamin’?